Find hotel near Ratunga Junction Theme Pa ..
Slingshot, funpass and mini adventure tickets have reduced tickets. Season ticket prices may vary. Love this? Explore the entire list of places to visit in Cape Town before you plan your trip. Fancy a good night's sleep after a tiring day? Check out where to stay in Cape Town and book an accommodation of your choice. How popular is Ratunga Junction Theme Park? People normally club together Old Biscuit Mill and Greenmarket Square while planning their visit to Ratunga Junction Theme Park. People also prefer to start their day with Ratunga Junction Theme Park. Unfortunately Ratanga Junction has closed down permanently. This white elephant was an amusement park with the Cobra upside down ride the drawcard. Even though the park had something for every taste and all ages, they could not stay afloat. This was due to the Cape weather which is very erratic, meaning the park was closed for most of the year. Because it was seasonal, the park was very expensive. I have fond memories here with my family while I lived in Cape Town. Love the Cobra and the white-water-rafting ride. Thanks for the memories. Keep up the good work. People might disagree but this place was my childhood. I don't know if many people remember crocodile gorge but that was like Disney world. I miss those days where it was big. unfortunately, they started closing rides down, one by one. I remember when there was a rumor saying that, before ratanga junction, they were actually building a South African Disney Land. that sounded crazy. 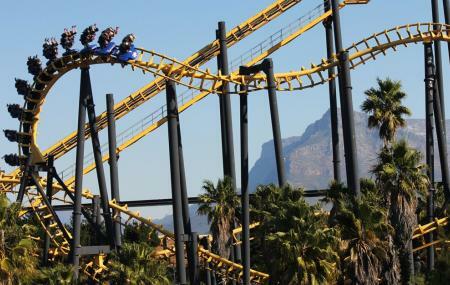 I hope that the owner of that theme park can have a sense to open it back up in a different location (in Cape Town) but make it bigger, better and maybe put up a hotel or 2 to make it a bit like a resort. You need a lot of money to do a project like that but there is hope. I just feel like there is nothing else that is fun for a 13 year old kid to do. R.I.P RATANGA JUNCTION!!! I just hope you can rise up from the dead and restore happiness to all the young and young at hearts. At R95 it was worth the money the day we went. At R179 normal it couldn't be justified. And that's why they went out of business even though they had all the fun under the sun in one place. You will be missed. Amazing can't even describe Ratanga. We all are super sad about Ratanga closing down. It was one of the best places to go on an wild adventure with family and friends.